Fix your Peugeot horn. Repair your Peugeot horn. Faulty Peugeot horn? Intermittent horn? I bought this car in 2009 and it had the intermittent horn problem from the start, despite a 300 Euro "service". Bashing the airbag would get it to work but, next day, it would be as bad as before. NOTE: several people have complained that they "can't see any corrosion" but my method still fixed the problem. The oxides that occur on zinc are often almost invisible to the naked eye so don't be surprised. Fixing this horn is a really easy job and all you need is a flat-blade screwdriver (or a 3.5mm [minimum] diameter rod or Allen Key), a needle file or emery board (cut to fit), sandpaper, small pliers and a portion of silicone grease. You can use petroleum jelly instead, but it may not be quite as reliable because it oxidises and goes brown. DISCLAIMER: The method used on this page is NOT recommended by Peugeot. It may cause problems with your airbag and could create other faults. However, it worked for me and it has worked for many others (see feedback below). YOU USE THIS INFORMATION AT YOUR OWN RISK! If you find this information useful, please link to it in your favourite forum or social media page. NOTE: PLEASE READ ALL OF THIS PAGE BEFORE ATTEMPTING REPAIR (including feedback, below). I welcome all feedback. If this worked (or didn't work) for you, please TELL ME your story so we can help others. I believe in freely sharing information! I will not reply to questions. Everything I know is already on this page so please take the time to read it all. If you have a QUESTION please post it in a FORUM. I do not answer questions via email because it's too time-consuming and I don't get paid for it. People invariably fail to state the tests that they have carried out (often none!) or to give essential information. Consequently, the emails go back ond forth for days or even weeks as I try to extract the necessary information to make a diagnosis. This discussion is far easier in a forum and allows others to post suggestions, too. Switch off all equipment, interior lights etc., and close the doors, leaving the driver's window open. Switch off the ignition and remove the key. Wait a full 3 minutes before disconnecting the battery. The car's computer must be allowed to go to SLEEP i.e. into "power save mode". Do not operate any equipment on the car during this time. Remember, even opening the bonnet will wake the computer on a car fitted with alarm. See below for battery reconnection procedure. Disconnect the battery (-) negative terminal (rearmost). This is done simply by flicking up the lever and lifting off the entire connector. Wait 30 minutes for the circuits to discharge. You don't want the airbag to explode in your face! Before reconnecting battery, read instructions, below. To remove the airbag and its plastic housing is simply a matter of pushing with a screwdriver or Allen key. See below. There's a hole behind each of the two steering wheel spokes. You can see a tiny portion of the screwdriver blade (red arrow pointing up at left of photo). The idea is to push the wire spring (blue arrow) to the right - see below. The green arrow points down at the offending brass connector! 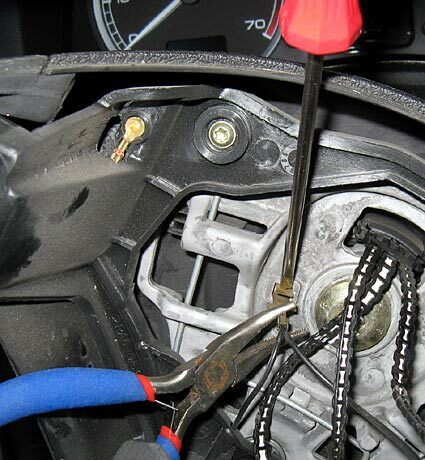 Pressing gently with the screwdriver will cause the wire spring to release the plastic hook of the airbag housing. Do this at both sides - see below. While pushing the wire springs, PULL the airbag housing towards you. You might need to pull quite strongly! (You might be able to release one side at a time.) Some vehicles have a third spring at the bottom, which must be released first. I didn't find it necessary to disconnect the airbag. It hung out of the way anyway. But don't let it strain the connections. Use the screwdriver to press down on the brass lug while you grip it with a small pair of pliers and gently pull it out of the oblong hole in the metal casting. Use a needle file to clean the surfaces of the oblong hole. A set of needle files can often be bought from a "Pound" or "Euro" shop. Alternatively, a nail file or an emery board (cut in half, lengways) should suffice. Then use it to clean the contact surfaces of the brass lug - especially the edges. If the wire snaps off the brass connector please solder it back in place. Apply silicone grease to the inside of the filed oblong hole and to the brass lug. Pull the U-shaped lug apart slightly to ensure a tight fit and push it into the oblong hole. Press the airbag housing back into place in the steering wheel. The silicone grease is REALLY IMPORTANT because it will exclude air and moisture - preventing future oxidation of the contacts. You can also apply it to other connections in the car - especially the various small light bulbs. 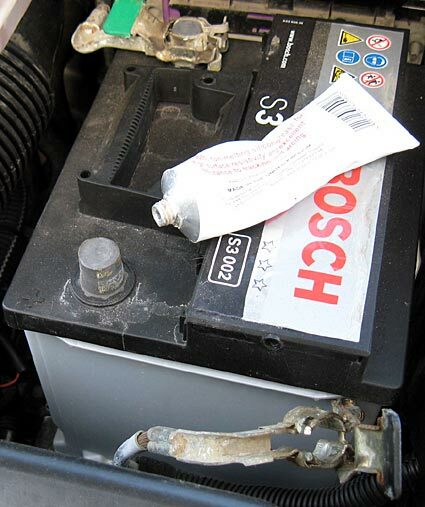 You must always carry out the following procedure to minimise the possibility of the computer corrupting its own software when reconnecting the car's battery supply. Ensure the procedure for battery disconnection has been adhered to and, importantly, everything is switched off and the driver's window left down. 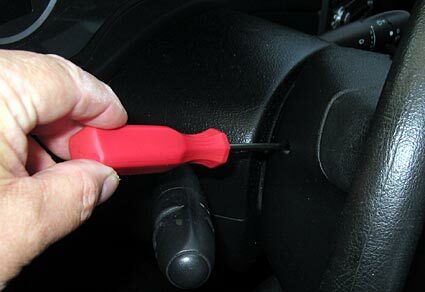 Remove ignition key if left in ignition. Reconnect battery. DO NOT open any doors. Switch on headlights through the driver's window (you will usually hear a "bong"). Switch on ignition then start the engine and check system functions. NOTE: Upon reconnection, if anything (e.g. interior light) is switched on, it could screw up the computer. Check carefully. Before reconnecting, clean up both lead battery terminals with boiling water (and sandpaper if necessary) and apply a coat of silicone grease to them. Reconnect (-) negative terminal LAST. This is the lead that is bolted to the body metal (chassis). Your horn should now work reliably and continue to do so. Below: the COM2000 module, complete. Failure is allegedly caused by breakage of a ribbon cable. Unfortunately, this is not usually repairable (but see feedback, below) so the entire unit must be replaced. Really poor design! Car tuning advice Click Here! Pug 307 horn fix - worked a treat!! Just a quick message here to say this method definitely works! I have just literally followed this on my newly acquired '03 plate 307 HDI 2.0 and she toots fine now! I have an issue with my horn (not peeping) on my Peugeot 207 diesel 2009 car. I tried to follow your guide but the steering wheel is different on the 207 from the pictures you have posted. I have taken some pictures of what I tried, but this did not resolve the issue with the horn. Hello, and thank you for a very nice and detailed explanation. Unfortunately it did not fix my non-functioning horn. Interestingly the ground wire behind the air bag on my car was a screw terminal, not a plug like in your pictures. I guess they changed the design. I've also got an intermittent problem with my indicators, and the button on the end of that stalk doesn't work, so I'm guessing it's the COM2000 unit that needs replacing. My Peugeot 307 doesn't seem to be running properly since I mended the horn. I followed your guidance on repairing the horn and it worked. Fantastic thank you very much. The only thing is the Engine doesn't seem to be running that well anymore: it seems like the engine wants to die on me as though it's running out of fuel. Would this be anything to do with the battery reconnection? I followed your guidelines and switched the interior lights and radio off before I disconnected the battery. But when I reconnected the battery I noticed the interior lights were on and I remembered you said it was important to turn them off. If I was to disconnect the battery again and follow your instructions again on reconnecting the battery would it solve the problem? It seems like the engine wants to misfire and when I put my foot on the accelerator is sort of misses. Do you have any advice? Thank you. Thanks for your feedback. Click HERE. Had a horn issue on daughters 307SW, your info was extremely helpful. Followed your detailed instructions and hey presto Horn works brilliant. Thanks again, it was so easy a fix as you stated. Regards Alan. Thank you so much - what a absolute champ. Now on to my whole left headlight not working. Horn problem on Pug 307 SW FIXED!! Thank you so much for sharing this quick and easy fix. I have suffered frustration for MANY years pushing on my horn with no result - here in Malta the horn is an absolute necessity to warn off potential problem drivers as sometimes it's a free for all on the roads. It is also used a a means of communicating! 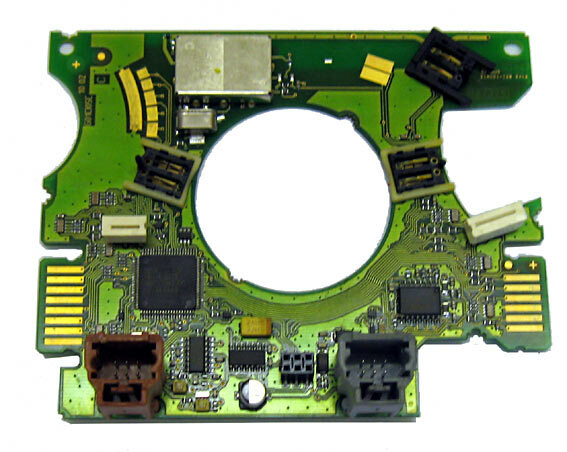 Anyway, to keep to the subject, after trawling the internet and resigning myself to having to change the whole switch assembly, yesterday I stumbled upon this site. I am an amateur DIY person with a keen interest in motor cars and a firm believer in the KISS principle (Keep It Simple, Stupid!!) and decided to give it a try. Followed your advice and job was done in under 30 minutes. Couldn't wait to try out the horn and what joy to hear the sound after so many years of intermittent operation and lately only thumps on the the steering column! Will probably pop over to the garage to check on it again as I can't believe it's FIXED. Thank you for your generosity in sharing. Thank you for your advise, horn now working after following your procedure. 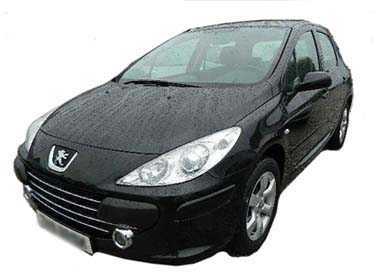 Peugeot 307 horn has been intermittent for some years and then completely stopped working recently. Garage said it was probably a ribbon failure in the COM2000 module and couldn't fix it. Offered to order another module. Tried your fix and the horn works brilliantly now. Many Thanks Herb. Yes, unfortunately some garage mechanics are either very ignorant or dishonest! Hi, my wife inherited her mum's 2003 Peugeot 307. The horn wasn't working. 2minute Google search and I find your fix. Took me maybe 15mins. After filing the contacts and the rectangular slot (There didn't look like there was any corrosion) silicone grease and popped it back together, worked. Cheers for sharing. thanks for posting this fix. I bought an old 307 SW with many electric gremlins, I am fixing them one at a time. Today the horn is fixed! Horn problem with a slight difference. I hope you can possibly tell me what I can do about the problem I have with my Peugeot Partner van (59 plate). The horn started making a funny little (quick) bleep whilst parked up yesterday. It kept doing this and so I unlocked the van and I found the horn wouldn't actually work when pushed, then all hell broke loose and it just went off on its own!! Nothing I could do would stop it, locking unlocking, driving off round the block etc then it just stopped. The van made a few more bleeps throughout the day but today it just went off again for about 3 mins. I drove home tonight and it went off on its own three times in 15 minutes. Sometimes the horn will work when I push it and sometimes it doesnt. I got home and it went off for ages so I have removed the fuse (F2) so hopefully that will stop it (for the moment). Any ideals on this at all? I don't have a wiring diagram for your vehicle. If it has an anti-theft alarm, I would suspect that. Otherwise, check your wiring diagram and see what is connected to the horn. Note: I do not answer questions via email. Please put your questions in the forum. See above. Will copper grease work instead of silicon grease on a peugeot 207 horn fix. Hi, Lloyd. There's no such thing as "silicon" grease. Silicon is a brittle element. All my references are to silicone grease, which is a flexible hydrocarbon, as used in breast implants. As you will note from my explanation, above (top), the purpose of the silicone grease is to prevent corrosion. It does this by excluding oxygen and moisture. It does NOT need to be conductive because the brass clip is in direct contact with the casting. It squeezes the grease out of the way. So, feel free to try the copper grease but I can't guarantee that it will work as effectively as the recommended silicone grease. Hi I have tried the method you have described above. However the horn still isn't working. It was working one day and the next it completely stopped! I also get an intermittent fault with the cruise control, do you think this is related to the horn not working and therefore I would require a comms 2000 stalk? Many thanks. Congratulations on being the first to report failure in ten years! First, thank you so much. I followed all your steps and instructions and my problem has gone. Just after closing everything, y realized that I have a can of conductive vaseline. Would it be even better than silicone grease? It would protect the contacts from corrosion and also make the connection more reliable, isn't it? I've never heard of "Conductive vaseline" but it's not necessary for the grease to be conductive. See my explanation above (top). The idea is that the metal clip makes a positive contact with the metal casting. The grease keeps oxygen and moisture out. Therefore, the connection should be good forever. For 2 year I put up with this extremely annoying intermittent fault and because the mot is now due I needed a solution. Thank you so much for your article -the instructions were superb! I followed them to the letter and 45 minutes later had a working horn. What more can be said apart from the fact if you have this problem bite the bullet, read the instructions and get the job done. When I bought (new) my 307 it had 4 replacement horns, finally they fixed it, on inspection I noticed that they had inserted brass washers to raise the assembly, I was not happy with this as I thought it to be dangerous. As a consequence I have battled with my horn for years, hoping that it would work at each MOT. If you are reading this and have doubts, just do it, your life will improve immediately. Many thanks for the very clear instructions regarding the horn repair, especially regarding the removal of the plastic airbag cover. In my case, it turned out that when I pushed the plastic cover down to sound the horn it wasn't depressing sufficiently to activate the horn. I ended up putting improvised washers over the two locating lugs(?) on the inside of the plastic cover. After refitting the cover it was 2 or 3 mm prouder than before but when I push it down it works the horn fine. It would be worth checking the actual contacts. After a few years of thumping they can become permanently bent and won't make contact. I followed the detailed instructions and I did it in 10 minutes. It works perfectly. Thank you. You are well appreciated. Thnx man! My horn works just great after your help! I cut the main power just as you suggested, and poked the springs with a screwdriver. Now it works beautiful! Thank you for sharing ...was on my way to have an additional (and working) horn & button installed to compensate for the 'temperamental' one when I came across this site ...you saved me the trip and a lot of money ...God bless!! Hi! Thankyou very much for the instructions. You made my day and my horn is now working perfectly! Thanks for the valuable information on how to fix the horn on my 2003 307 Peugeot. I had to use two 5mm allen keys as it seemed to get stuck if I tried to pop one side. Brilliant . EXCELLENT. Saved £200. 75 year old ex LGV fitter. I just wanted to say a big thanks for this. The horn on my 53 307 has been playing up for years, though it mostly worked in that time. A couple of weeks ago it totally gave up the ghost. Following these instructions I fixed the problem in minutes. Thanks for the clear information. Brilliant fix, thanx for the info it saved a lot of diagnostics. Thank you for the Peugeot 307 horn fix. Your guide helped me to fix the horn. Thank you very much for taking the time to post the fix online. Like all below, I just want to thank you for this tutorial. Just forgot to buy some silicone grease, but I hope CRC's all purpose oil will do the trick for a year or two. Apply silicone grease to the contact surfaces to prevent oxidation. Thanks so much from Sydney, Australia, for your easy-to-follow solution for fixing the horn in my 2003 Peugeot 307. Not only is the problem solved but you've boosted my "mechanical" confidence and saved me money. My 307 did not have that brass clip inserted in the baseplate but the wires were attached to the aluminum baseplate with a screw, probably an attempt by the Peugeot engineers to fix the issue. It's not aluminium - it's "Mazak", a zinc alloy. Apply silicone grease to the contact surfaces to prevent oxidation. The lug was corroded as well as the aluminum base, so I did have the same horn issue. Cleaning both parts fixed it. Many thanks for the info on the intermittent horn problem - I would never have thought of looking under the airbag without your solution. 1. I found three slots on the back of the wheel and had to remove the shroud first. Best to release the bottom clip first as it seemed to jam if the two side ones were released first. 2. Rather than put it all back together with the risk of the same problem happening again, I drilled a small hole adjacent to the rectangular hole, fitted a small self-tapping screw, cut off the brass connector, stripped the end of the wire, wrapped the bare wire round the screw and tightened it. Guaranteed good connection for the foreseeable future with no possibility of corrosion. You can do that if you are handy with a drill but there's no need. Mine has survived six years with only silicone grease, as described. Wrapping bare wire around a screw doesn't guarantee a reliable connection unless you coated the wire with silicone grease to exclude air and moisture. I have an extra tip for those who are troubleshooting the 2003 Peugeot 307 XS 2.0 L car horn problem. This article applies to constant or intermittent horn problems. It is some work to take off the bumper or panels or steering wheel parts on the Peugeot to track down the horn problem. It is a good idea to resolve the problem into 1 of 2 areas by looking inside the main fuse box which is under the hood/bonnet on the left side of the car. Take the plastic cover off of the fuse box and you will see some large colored connectors. Pick the green connector that has 16 pins with wires comming out of the top of it. 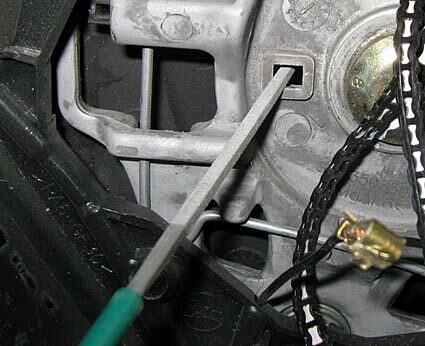 Identify pin 15 (WIRE# 2500, THE 2ND WIRE FROM THE END TOWARD THE FRONT OF THE CAR ON THE CENTER CAR SIDE OF THE CONNECTOR) which is the wire that goes down to a horn below and to the front of the car. Take a jumper wire and connect the +12VDC from the Peugeot battery MOMENTARILY to this wire at the top of the connector. If the horn blows, the problem lies between this connector and the horn button at the steering wheel. Very likely, if the horn does blow, the problem will be fixed by following the instructions that have been laid out above by the owner of this webpage. If the horn does not blow, you will need to get to the horn by dissassembling the front of the car as described in the service manual. Karl Ernhart suggested shorting terminal #2500 on green connector to 12 volt terminal, to see if the horn works. The connectors have the numbers embossed on them 1 to 8 on one side and 9 to 16 on the other side. If you short the wrong terminal and are unlucky you can start a fire...as there is no fuse in a piece of wire. The safe way is to check for +12 volts to earth on terminal 15 when an assistant presses the horn; if not, head for the steering wheel.. I followed your instructions and fixed my horn problem. The connections showed no signs of corrosion but I cleaned and silicone greased the connection anyway. The real difficulty I had was in releasing the Airbag: the right side was difficult; the left side took me an hour and much force. Thanks a lot for all the help on your site. Thanks for posting your instructions - took 10 minutes all in and worked fine. Just to say that I found keeping the screwdriver horizontal helped connect with the metal spring-rod to push it back, and I found once I connected with the metal rod it was a positive feeling, but I had to pull fairly hard on the central area of steering wheel to get it out - it doesn't just pop out. And I worked on one side, then the other, rather than just popping it all out by pushing in both sides at once. I cleaned up the central pushfit connector as said, and applied some electrical cleaning spray I had to this and the three other visible connections. Great - worked fine straight off. OK but cleaning merely fixes the contact problem temporarily. 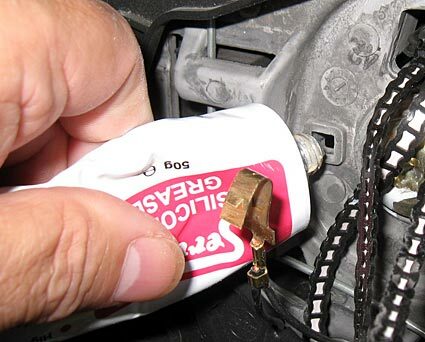 You MUST apply silicone grease to the contact area in order to exclude air and moisture and prevent future corrosion. Heater fan - open air conditioning and get into the back of the heater fan by the driver's leg, (rather than going in through the glove compartment area). Then pull out resistor? box and clean connections - works fine, 1hr or so. Same comment as above. Apply silicone grease. Front indicators worn connection: this can be solved by drilling a hole in back of indicator cluster and wiring that way, bypassing the dodgy connector which burns out - otherwise I believe it's a whole light cluster. Apply grease to prevent this problem in the first place. Intermittent ABS warning - I solved mine (touch wood 3 years) by taking off the rear sensors - I found through corrosion they move away from the section they are sensing, one needs to clean them up and perhaps a washer is needed to bring the clearance down - for me, problem solved and I think this problem also came about after the Peugeot recall, where they fiddled with the ABS settings (money making scheme???????) - the ABS worked fine before, and I think a few people had this problem develop after the Peugeot call in. 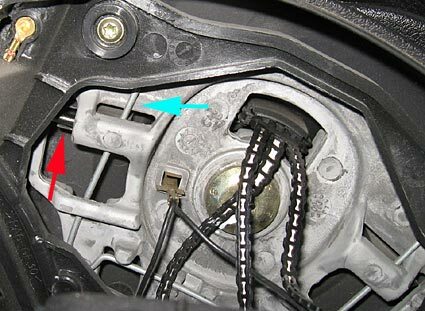 Don't let the auxillary belt get worn; it can shred, ruining the alternator drive, and even enters the timing belt cover stripping the timing belt of teeth. Lights are terrible, but I've changed a lot for LEDs, which has reduced the problem. The glodark explanation is really good but I do have some suggestions to make the job easier. The main worry was disconnecting the battery. There's a cover over the battery on my 307 HDI 90 diesel and only the positive terminal is readily accessible. I asked at the garage where I have it serviced and was told that disconnecting the positive terminal alone would do. Everything else in the glodark list applies so read through it carefully. If you switch on the ignition and something isn't connected you are in big trouble. Follow all the steps, particularly the 30 minute rule. Poking a screwdriver into those holes by the steering wheel isn't the best approach. I watched a video of someone struggling to engage the spring release catches with a small screwdriver. Engage the steering wheel so it is slightly to the left (it will lock into that position if you prefer) and insert a 5mm hex wrench to release the clips holding the airbag assembly in place. It was easy to feel the spring against the allen key. The terminal hole that needs to be cleaned of corrosion is small. I made a little file by glueing two halves of a drinks stirrer together and covered it with glasspaper. Unfortunately, this was too wide to fit the rectangular hole. Rolling up tightly a few strips of fine abrasive paper to give a tool about the size of a fat matchstick worked. Make a thorough job of cleaning up the hole and spade connector. I could see the green corrosion on the abrasive paper. It was easier to clean up the brass spade connector and I opened it up a tad so it would fit tighter. Add the silicone grease before replacing the connector. A cotton bud is ideal for this. Don't forget to wait 3 minutes after checking that everything is connected before turning the key. I now have one of those rare Peugeot 307s - one where the horn works. Excellent write-up on how to fix this annoying problem. As an amateur mechanic I really appreciate the time saved by the photographs and instructions. Once I had everything in bits I also took the time to remove the horn push surround and clean the rear contacts (mainly for peace of mind). Also an easy job once the air bag is removed - just remove the Torx screws being careful not to drop the springs or front plastic locator. I used a pair of needle nosed pliers to take them out once the screws were removed. Off to the "Control Technique" now..... (French MOT). Well done! After the mechanic told me I need a new horn, I am so happy that I solved it on my own with your great instruction. Thank you very much. And guess what - it worked perfectly after following the very good detailed advice and photos on the site. I am very pleased and just wanted to say a big thank you. Thanks for this guide. I now have a working horn. It was very easy to do with the instruction being very clear and images to help. Oh my God, this worked! Bought used car, Peugeot 307. Horn not working, but was working when I bashed it. Garage asked for £300 for new com2000; tried this (Glodark solution) instead and it worked. Thanks a lot :). When I followed your instructions I realised that this was only the chassis connection, Not the contacts that actually make and break the circuit. If you undo the torx screws in the picture showing the screw driver and brass connector - beware of springs falling out - then you can clean the contacts that are more likely to be the problem due to electrical corrosion. Again Don't forget to grease with silicone! (I disagree with "more likely to be the problem". Those button contacts get abraded (and cleaned) each time you sound the horn, so the contact area stays quite clean. They will only be problematic if the car is left unused for a long time and is damp inside. Thanks worked great, only took 15 mins after 30 min battery disconnected . A little tip for 52 plate hdi 90 rapier - if your horn works when you press the door lock on your key twice, you can be almost certain this is the problem and can be fixed easy. Thank you so much for all your help. Horn working perfectly. Car going for its NCT next week. Once again thank you. Thank you for solving a problem that been last for years. Absolutely fantastic, followed the procedure as you described. After the initial half hour wait, I took the airbag off, cleaned the connections, put it all together again; we have sound. Next time it happens, it's a job for my 10 year old grand daughter - so simple, thank you. Apply silicone grease to the contact surfaces to prevent oxidation in future. I'm not sure what you mean. I replaced my pollen filter. It was made difficult because the previous mechanic had fitted it the wrong way round and had also broken the plastic rivets. I refitted the new one the correct way round and used self-tapping screws to hold the cover. Another clever money-saving mechanic's trick was to fit the small size brake pads as used on the smaller engine, manual gearbox model. I wondered why the brakes were squealing! A competent mechanic pointed out that, with half the contact area, the incorrect pads were melting! The discs had to be skimmed before the correct pads could be refitted. More expense caused by incompetent so-called mechanics! First of all thank you very much for posting on the net. My problem is that when I push with the screwdriver I can feel the metal bars moving, but nothing happens I.e the housing does not seem to release or I cannot feel the metal bars catching, am I doing something wrong? thanks. There's obviously no answer to this other than "yes". Please look at the photos again. You have to release the springs and pull the airbag housing towards you. A working horn after so many years! Aw matron. After several years of the horn not operating correctly and sweating over whether the thing would work on the day of the mot, I stumbled across your site. An hour later and it works! You should become a surgeon and, if you do, can you have a look at my knee? Thanks for the trouble you have taken to produce the site. Worked a treat. In for mot on Monday. Thank you. Thank you so much for taking your time to post all this information. I didn't have a problem with my horn but needed to remove the indicator stalk unit. This was a great help when I found this information, as my husband was just about to remove it all & I had visions of the air bag going off on him. Can not thank you enough as if we had not used your info we would have been in trouble (got him to clean & grease the horn terminal at the same time). Thanks again & all the best. Thank you for your page in fixing the horn on my daughter's 307. We were delighted when, after we put it all back together, the horn worked as it should do. Never had any problem following your instructions, went a dream, thanks again. No problems doing this; only took 15 mins to fix; passed MOT first time yesterday. Saved me a fortune. I have a 2003 "Partner" and have had this problem for years! Every time I checked the connections the horn would start working but after a day or two would stop. With MOT (ITV here in Spain) it had to be sorted properly. Two things, my Partner had a third hole to access the lower half of the airbag spring. Ribbon cable can be repaired, if you carefully remove the plastic covering over the break and paint it with metal paint it should work. Be sure not to short out the adjoining cable; with patience it can be done; used to work for me as a computer engineer. Thank you very much for your advice. I had problems with my horn since I bought 307 in 2009. And it cost my just 6 pounds for grease and 20 minutes of work to solve this problem. I've struggled with the horn in my Peugeot 307 for some time; after all it's a piece of equipment that should be in working order according to (at least Finnish) law. This guide helped me to get it fixed in an hour with low cost (the silicone grease for five euros). I would like to recommend a minor improvement to the guide: when doing this repair, one needs some sort of pliers to get the brass connector out of its slot. That's fine, but the pliers wasn't mentioned in the tool list when preparing for the job. It's not a big deal, but I only realised that when I had started the job and taken the airbags housing off. All in all, I'd like to thank you once more. This repair guide definitely made the difference, and my horn is now working, and hopefully continues to do so thanks to the silicone grease, which was introduced as a new thing (to me atleast). This guide is highly recommended, allthough one must carefully follow this particular guide to the letter, otherwise there are certain things that can go horribly wrong: airbag exploding or the car's computer corrupting its software. Enjoy the guide, get your horn fixed in a safely and well planned manner and drive safe! I cannot thank you enough. My car failed its MOT because my horn decided to stop working on that day (2004 307 envy works when it wants to). I had 10 working days to get it fixed and I was in a panic. Came across your step by step guide and fixed it...me..a single mum! Mwah! I followed the instructions to the letter and, "lo and behold", it worked a treat on my 2004 Peugeot Partner van. Many thanks. I was quoted £130 for my intermittent horn to be fixed at my local garage. After finding your page I was able to buy a £2.25 tub of silicone grease and get it working using 15 minutes of my time (plus waiting half an hour after disconnecting the battery). Thank you very much for posting the pictures and description, you must have saved hundreds of pounds for people in total. Other tips: if your screwdrivers are too wide to fit in the holes, try an Allen key instead, it made the perfect pushing tool for me. Also, if you have no needle file, use a tight roll of fine sand paper wrapped around a small Allen key to clean the contacts. A remark: my 02 reg 307 diesel doesn't make a bong when I turn the lights on 10s after reconnecting the battery. Everything appears fine though. I would like to thank you for the defect rectification advice.I have had the same problem that you talk about with my Citroen Berlingo horn. I have been a motor mechanic all my working life till I retired and moved to Spain. This problem was getting on top of me and no one had any cure that I spoke to. I followed your article and I was pleased with the working result. I have read many motor trade forums reference this problem and was not impressed. Thanks guys. Once again another positive feedback. 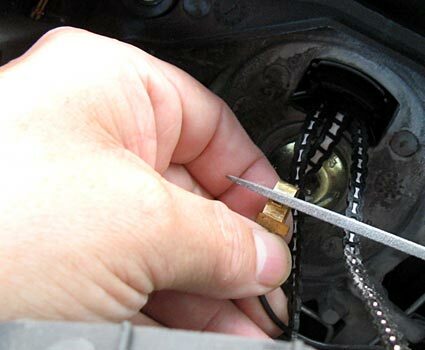 Used this tip on 7th Jan 2012 and it was great, there was a small problem I had that was detecting the spring clips but I found another blog which suggested using the screwdriver almost parallel to the face of the steering wheel which certainly helped in locating the spring arms. Many thanks for the photo help too. Many thanks for the description and supporting pictures....works a treat. Apologies to everyone in my area for horning you, I'm just so excited. I have been experiencing horn failure issues with my 307 for several years. I followed your instructions and now ok. (15 Minutes) Previously I have had to bang hard on the steering wheel, so it working for a period of time. The family will be upset, because they always thought the air Bag would be deployed one day. Absolutely brilliant saved me a lot of money and each stage was perfectly correct. Thank you for your trouble. One other tip is that in my case the brass spring clip was loose in the slot so I opened it out and, when pushed back in, it made a solid click. Vaselene was my choice to protect it. Nice one! Vaseline might be OK but it oxidises and goes brown so I'm not convinced it's as reliable as silicone grease. Hi there, I just wanted to say thanks very much for posting up this guide. I have a 06 307 SW which had the same problem with the horn. Once I took it apart I noticed that the connector was slightly different; it was more of a round ring connector that was screwed down. Anyway, since I had the airbag housing etc. already removed, I decided to give it all a good clean and protected it with a bit of silicone grease. I put it all back together and it's working perfectly again. Thank you so much!!! Ik had sinds twee jaar al problemen met de claxon. Met behulp van deze handleiding was het probleem in twintig minuten verholpen. Thanks for such an easy to follow set of pictures and instructions. I have just fixed the horn on the wife's 307cc with ease. The only problem I encountered was the brass connecter decided to bend over double when I pushed down with the screwdriver so it took a little more coaxing to free it,(approx. 2 minutes added). Thanks for saving me a fortune at a Peugeot dealers for the simple solution to the problem. Oh my god. I've been suffering with a faulty horn for 3 years. Every time I go for an MOT it either fails or I get an advisery note. I followed your instructions and now it works perfectly. Probably took me 1 hour, but that's because I didn't have a file small enough so used tiny piece of rolled up emery cloth. Thank you so much. This fix also works with my 2007 Peugeot Partner, although there are three holes to poke with a screwdriver to remove the airbag. Bottom one first and then either side. It's also necessary to remove the steering column shroud to get at the holes. No biggie though, just three Torx screws. I would like to thank you for helping us to cancel the air bag light and to repair the horn on our Peugeot 307. We were in Spain and with frustration we were almost ready to scrap the car. Your instructions were superb and it was fixed in 15 minutes in the soaring heat. Thank you so much for putting this on line. My 307 had the same trouble. I took it for MOT this year: pushed - nothing - failed! It was driving me crazy. I found your article and did as you said, it now works perfectly. Thanks so much. I wish there were more people like you around, could save a fortune on garage bills. One thing though; It says to disconnect the negative (-) terminal on the battery but the picture shows the positive one being disconnected. I believe it should be the positive terminal right? That's at least the one I disconnected and it worked. The negative terminal is earthed isn't it? Safest method is to disconnect the (-) NEGATIVE terminal first and reconnect it last. Failed the MOT on the horn ... just took it for granted that it would work as I can't remember ever using it. I followed your advice ... except I didn't have a file to fit, so used an emery board. Tremendous instructions! Thanks very much for taking the time to put this on your site. This brilliant mate I have taken my car in for MOT last year they reckoned they had fixed it took them two days I did this in ten minutes after the half hour wait period. Thanks a million. Why don't workshop manuals illustrate and describe procedures as clearly as this ? Thank you so much ! After being misquoted and then offered a resolution, but at a "pay as you go" rate (£53 plus VAT), I followed your instructions. So £3.91 for a tube of silicone grease, no more than 15 minutes to do as you advised, and all is well. Thank you REALLY very much !!! I went by your tutoral and it worked great, thanks. I would just like to thank you very much for your info & pictures regarding the removal of the air bag on a peugeot 307. I wish that I had found your info. before I wasted two hours removing the horn, checking fuses etc. Peugeot quoted £75- to fix the problem, but thanks to you I sorted it myself in 15 mins. I cannot believe this it actually worked. It was so easy to do, thankyou so much. I mean it. Auto Repair Shop Owner Finally Reveals Insider Secrets That Will Prevent You From Being Scammed By Your Mechanic. Click Here! Just a quick line to say thanks for posting such an informative article. Found it via HonestJohn when googling Pug 307 horn fault as mine failed the MOT today and I was worried about prising the horn button off because of the airbag. Anyway, it was great to find the fully documented procedure so I can sort it out at the weekend. Thanks for taking the time to publish it. I want to say thank you so much for this instruction you put online, I followed it exactly and it has resolved the horn issue. Just like to say a big thankyou for spending the time by putting the photos on a website on how to fix a horn on a peugeot 307. I did put it into a garage on 2 different occasions. It worked one day then didn't the next. I followed your instructions and it worked like a treat. Neighbours not very happy as I am pressing the horn none stop. Many thanks again, Jimmy D.
estoy muy agradecido por la perfecta explicacion para reparar el claxon del Peugeot 307 cc. En 10 minutos solucionamos el problema. Un Sistema Probado de 7 Pasos para la Mejor Compra un Auto Usado. El Manual más Completo con 80 fotos, 16 formatos, y todo lo que necesitas para encontrar, checar y comprar el mejor auto usado de forma segura. Click Here! Yes, I have just performed this on my (2004) Peugeot 307 SW. And it worked fine. In my case, although the brass lug looked as new, scraping the inside of the hole that makes contact with the brass lug - was necessary to fix it. This kind of problem, a regular autocentre can't usually handle and you have to hunt down an auto electrics specialist to even diagnose something like this. And it can be a big hassle. So thanks very much for posting this, is really appreciated. A huge thankyou for publishing the guide on removing the Peugeot 307 airbag and repairing the horn. I was a bit nervous about removing the airbag, but it was actually quite easy following your guide. The offending connector looked fine, but once I'd given the hole a good rub with one of the wives nail files (really), the horn worked perfectly. Thanks a million. Thanks, Duncan. Interested to know how many wives you have? I tried this last night to fix my horn as it had totally stopped working and my car is due its MOT. I am by no means the best person to attempt to fix a car but this worked very very easily. Can't thank you guys enough, without doing this I would probably be £100-£200 out of pocket from peugeot ripping me off! Avoid mistakes when buying a used car. Professional tells you how. Click Here! I have a Peugeot 307 1.4 LX 2001 model where the horn didn't work! I used your guide to fixing the horn on my Peugeot 307 - poor connection, as you identified. It is now working perfectly - thank you! Thank you so so much - my MOT failed because of the horn not working, so my parner found this information - followed it exactly and it works perfectly. Thanking you. It worked like a charm! I bought a Peugeot 2.0 hdi 2.0 90kw in Sept. 2010 and had the intermittent horn problem from the very beginning. My trusted (cheap) garage could not fix it. I tried it today and took 30 minutes to solve it (even though I accidentaly broke a tiny part of the brass) and by following your comprehensive instructions I finally solved the annoying problem. The brass was the problem. It was corroded so that it didn't make a good contact to the metal oblong. Thanks for your awesome tip, and keep up the great work. Worked a treat, and I mean a treat - the horn sounded better than ever with minimal pressure applied. One slight note - I over pulled on getting the brass connector out, slipped and managed to pull the top black wire form the connector. I therefore trimmed the insulation back, opened the 2 wings on the connector with a small set of pliers and put the wire back in and closed the wings. You should coat the wire with silicone grease before closing the wings. Hey that is a brilliant piece of info. The horn problem has been bugging me for nearly 18 months. Got it fixed at a garage before and cost me! Fixed it in 15 minutes with your help and now I know what to do if it happens again. I've great admiration for guys like you that take the time to share your knowledge and experience. Inspires me to do the same. If you have a QUESTION please post it in the FORUM.